Ah, the Mifflin St. Co-op. The neighborhood no longer willing and/or able to sustain it as a business, it closed its doors a couple of years ago. 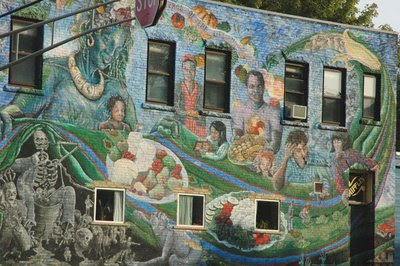 The spectacular mural on its Mifflin-facing wall, however, remains relatively unchanged, and I hope it stays that way. For a great, comprehensive history of the Mifflin St. Co-op, check out Waxing American's post on the subject. I'm somewhat surprised that I totally failed to catch this when it happened ("somewhat" because I was rather engrossed in my own project around that time), but I've just received an email from tipster Q about a really cool graffiti wall project that happened over at Brittingham Park back in July. Photos from the event are now available for your viewing pleasure here. Sadly, the wall was only up for 11 hours, and though by its very nature street art tends toward the transitory, that's really a shame in this case. Still, I'm happy to read about the organizer of the event, Kimberely Coonts, who was also apparently behind the graffiti wall that used to go up during WSUM's Party in the Park. People like her do a great service for our community, and we should all do our best to support their efforts. Check out the article about the event here. The problem arises when [graffiti] is without permission and has defaced businesses," she said. "There are a number of small businesses that are running on a very tight margin as is, and when they have to stop what they're doing to go out and undo the damage that somebody randomly inflicted on them, it's detrimental to the business owner and it doesn't reflect well on the neighborhood." Thurber added that there is a city ordinance that forces business owners to remove graffiti in a timely fashion, or they can be issued a citation on top of the cost of removing the graffiti. 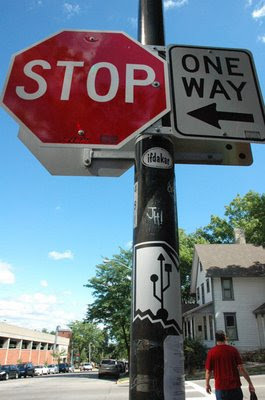 I've heard about that ordinance before, and honestly it strikes me as a silly and potential harmful way of dealing with the problem of tagging. Forcing the business owners--the "victims" in the case--to pony up money (this in addition to any cleaning costs) should they take a bit too long in cleaning it, seems ridiculous. And it can't help foster much in the way of a potential positive relationship between businesses and more legitimate street artists. Isn't there another way to deal with this? I mean, I'm not fan of tagging, and hardly consider it "art" on par with the type of stuff I post here, but this doesn't seem like the right solution. What do you think? Laser beams! From its eyes! Sender-inner Jesse spotted this lovely piece near the dumpsters by Amy's Cafe and emailed it to yours truly via some sort of fancy cellular technology. The kids and their gadgets these days--I can't keep up! But street art, ah yes, that still makes sense to me. 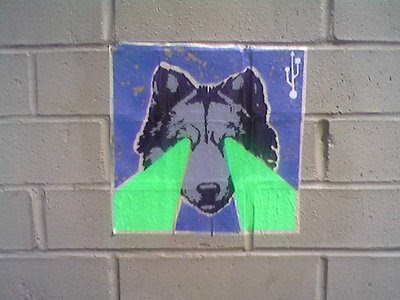 I mean, who can't get behind a wolf shooting friggen laser beams from its eyes?! 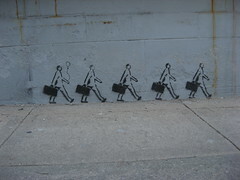 That little symbol indicates that this may be another piece from our good street art friend, USB. Sort of a combination stencil and sticker or paste-up, I think. Another couple of submissions from David D. (thanks!) here - some interesting stencils. 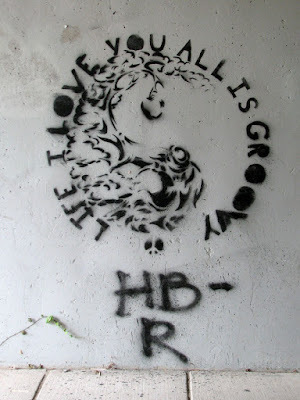 This first one is apparently on the Murray St. underpass, and the second is somewhere in the Langdon St. area. I'm not sure who the guy in the second one is, though, so if you recognize him as some celebrity I ought to know, please holler. And as for "Life I love you all is groovy" - I have no idea, but I tend to agree. 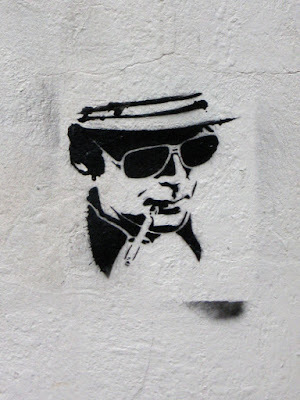 That's not Hunter S. Thompson, is it? As a side note, I'd like to recommend that you click this link and head on over to the Wooster Collective to check out some really amazing, epic-scale street art from Greece. I want to see stuff like this in Madison! Nicole P. sends in this positively fierce submission, showcasing the always imposing form of Mr. T on what looks to be the side of a utility box of some sort (on Midvale Blvd). We're pretty sure this particular one has since been scraped off, but others have been sighted around town. 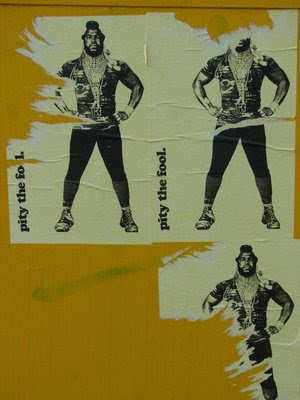 Long live Mr. T! 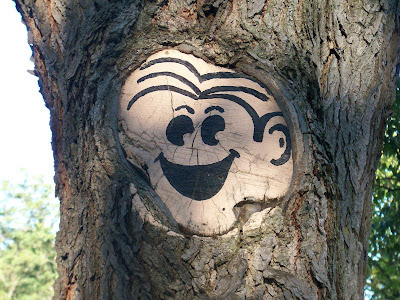 True or not, the happy tree would like you to think positively about the coming eco-apocalypse! Or maybe it just hasn't realized what its own fate would be in such a scenario. Uplifting! Thanks to Dave D. and Emily S. for sending these in. The first can be found in the Langdon St. area and the tree is somewhere on Donna Dr. in Middleton. Downtown on the capitol square: two free, local newspaper stands and two, I can only assume local and free to look at stickers. 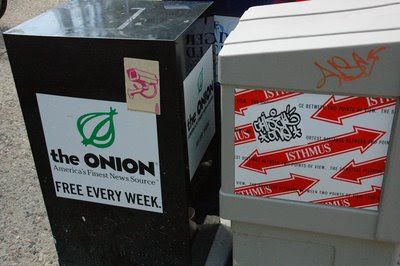 Interesting choice of placement for the CCTV one--I can only hope that the Onion doesn't make a habit of tracking my movements. But then, the commentary that accompanied the surveillance might almost make it worth it. I've seen this symbol pasted (or is it a sticker?) up in a few places around town, but this is definitely the most prominent. Located on the light post out front of Cafe Montmartre, I'm pretty sure it's some kind of old Mac system icon, but I can't remember exactly what it stands for. Whatever the case, there's something weirdly aesthetically appealing about it. UPDATE: Thanks to an astute commenter, I've been schooled in the fact that this is the USB symbol (I really should have known that), and that it's one of the favored designs of this local artist. 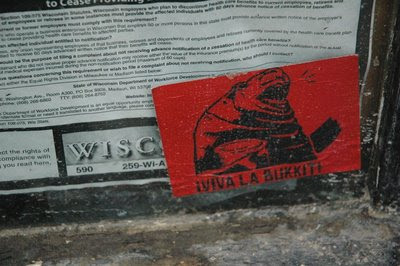 This sticker, I'm told, isn't unique to Madison, but it was one of the few interesting pieces I saw on my stroll down State Street the other night, so I'm posting it anyway. If you're unfamiliar with the particular internet meme from which this sticker draws its inspiration, 1) you're clearly not as huge a nerd as me and 2) you can find out about it here. Yesterday evening, finding myself without other plans, I decided to sling the ol' camera over my shoulder and take a stroll down our city's venerable pedestrian thoroughfare: State Street. Even without the students back in full force, which they most certainly are now, it's a place where you're pretty much guaranteed to see something of interest, and tonight did not disappoint. 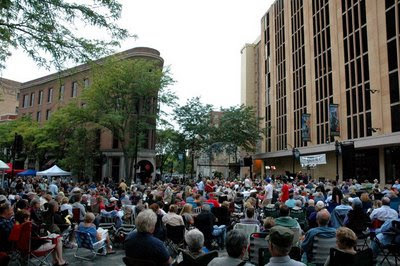 I started at the top and found myself among a sea of people enjoying the free "Jazz at Five" concert series featuring the fantastic Jon Hendricks (and you if you don't know who that is, you owe it to yourself to follow that link and find out). 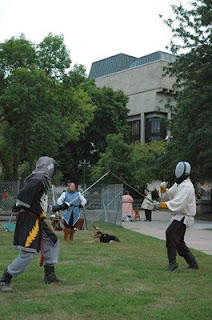 Then, in perfect contrast, I discovered a group of SCA folk sword fighting down on the other end at Library Mall. Seriously, it doesn't get a lot more State Street than that. I have to say, though, that the place is looking more and more scrubbed clean these days. I did manage to find a few lone examples of street art amongst the shiny new concrete and metal being installed. 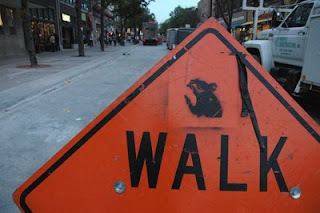 The cool rat stencil (below) graced a construction sign along where State meets Lake, but who knows how long that will last. I'm a little bummed by how clean and pretty the city has been working to make the street appear. Granted, I've only been here since 2000 and the area has a much longer and more storied history than I've been witness to. Still, even I remember a more crunchy, colorful, oddball State Street. Things have changed a lot in recent years, and I'm not entirely sure I like the direction they're going in. I'm hoping that the lack of street art in the area, though, will be short-lived as the construction projects finish and students filter back in for the semester. In the meantime, the rat keeps watch. Ann submitted this little number, and I have to say, I really dig it. Poor little yellow cat--what's he so upset about? There's a lot going on in the world to make a person, or a hand-colored paste-up, feel pretty blue (or yellow, in this case). 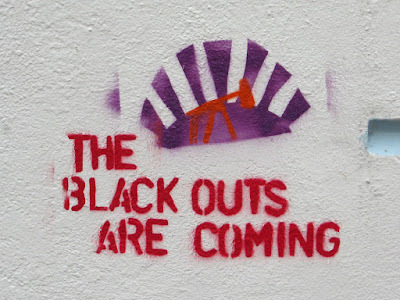 I'm not sure if this stencil is still there, but for a long time it graced the outside of Isthmus HQ in downtown Madison. This picture was taken back in March of this year by Scott M. (thanks for the submission! ), and I do believe he's correct in thinking that the balloon was added later. This is one of my favorite pieces that I've seen in town. Somehow both playful and serious, it's simple but effective.